Portugal is one of the sunniest countries of southern Europe and attracts millions of tourists each year. Residence Royale selected a large number of luxury holiday villas and vacation homes in the Algarve, primarily in Vale do Lobo, Quinta do Lago, Vilamoura and Carvoeiro. In the Lisbon area we selected some beautiful villas on perfect locations near the Atlantic Ocean. Luxury villa Jamy is for rent near Benagil and Carvoeiro in the Algarve (Portugal) within walking distance to the famous da Marinha beach. Magnificent holiday villa for 12 with 6 bedrooms, 6 bathrooms, air conditioning, WiFi internet, heated infinity pool and breath taking sea view! Holiday villa Pine Cliff is for rent near Boliqueime in the Algarve (Portugal), only a 10 min. drive from bustling Vilamoura with famous yacht harbour, restaurants, bars and shops. Lovely holiday villa for 8 with 4 bedrooms, 4 bathrooms, WiFi internet and private swimming pool! 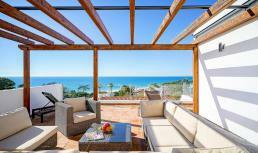 Villa Bonita is for rent in the luxury resort Vale do Lobo (Algarve) within walking distance to the beach (15 min.). Lovely holiday villa for 10 with air conditioning, WiFi internet private pool! Villa Corona is for rent in the luxury resort Vale do Lobo (Algarve) close to the Ocean golf course and within walking distance to the beach (5 min.). Luxury holiday villa with 5 bedrooms, 5 bathrooms, air conditioning, internet, sea view and heated pool!